With Windows Medkit, you are given access to an array of different tools which allow you to get into the nitty gritty of your system setup and fix whatever malware may have changed. This includes startup programs and services, processes, settings and more. In addition to providing a way to repair Windows settings, Windows Medkit also offers some utilities such as blockers, shutdown prevention and more. This application is very nice to have around in the event that you've downloading something which has made changes to your system. Windows Medkit is licensed as freeware for the Windows (32-bit and 64-bit) operating system / platform from system cleaning software without restrictions. 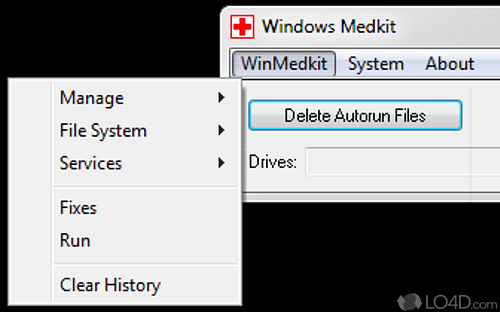 Windows Medkit v1.63 is available to all software users as a free download (Freeware). Compatibility with this error remover software may vary, but will generally run fine under Microsoft Windows 10, 8, 8.1, 7, Vista and XP on either a 32-bit or 64-bit setup. A separate x64 version of Windows Medkit may be available from Michael Ascker. This download is distributed as WinMedkit.zip and download. We have tested Windows Medkit v1.63 against malware with several different programs. We certify that this program is clean of viruses, malware and trojans. 3.7 out of 5 based on 3 ratings.